More commonly used to create fire hoses or formula one engine parts, Thermoplastic Polyurethane, TPU for short, is an extremely durable and eco-friendly material. TPU is known for it's abrasion resistance and can withstand temperatures less than 0°F and greater than 180°F. 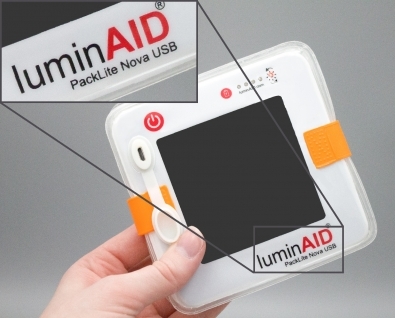 At LuminAID, we source high-quality TPU that is specially formulated to have high UV resistance. Your lantern should not experience extreme yellowing or become brittle and crack, no matter how long you use it! 1-Year Warranty if you aren't feeling crafty. Engineered to make inflation simpler, there is a pie-shaped slice inside the valve on all LuminAID PackLite Series lanterns. This allows the lantern to be inflated or deflated simply by pushing or pulling on the ends. Our valve is designed for simplicity in relief aid situations around the world, especially in areas where people may not be familiar with bite valves.